The Authors: Snorre Greil, project officer and Soley Kaldal, risk management and safety engineer, Department of Operations, Icelandic Coast Guard. Iceland is the 18th largest island in the world, approximately three times bigger than Ireland, but sparsely populated with roughly 340.000 inhabitants. Iceland is quite remote, located in the northernmost part of the North Atlantic with Irminger Sea to the west and Greenland Sea to the north. Weather is unpredictable here with rapidly changing conditions; winters are long and dark, and storms are frequent. The highest wave ever measured in the world was detected by a buoy in the waters south of Iceland in February 2013 – a wave as tall as a six-story building. With the melting sea ice, new technologies and more global prosperity, maritime traffic is increasing in the Atlantic, be it small yachts, passenger ships, or large container ships. 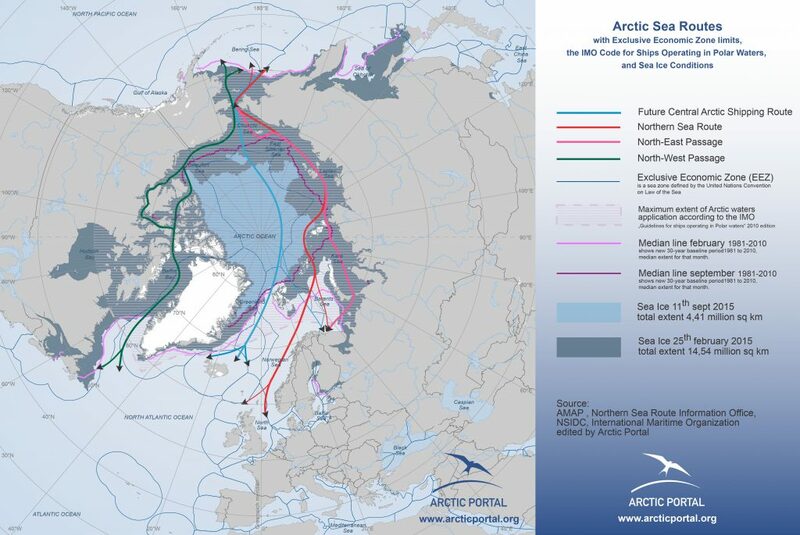 Whatever opportunities the future may hold regarding commercial shipping in the Arctic region, for example via the Northeast Passage: Icelandic waters will continue to be part of important shipping routes between Europe and North America. There are eight Arctic nations, and six of them are responsible for search and rescue regions reaching north of the Arctic Circle. 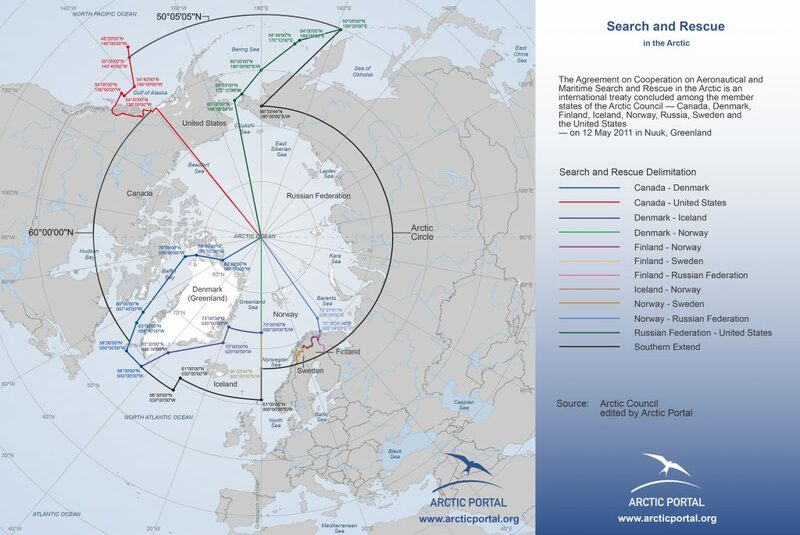 Figure 2 illustrates the search and rescue regions of the nations that encircle the Arctic and their division across the North Pole. These regions stretch over areas with limited connectivity and far away from infrastructure. Increased traffic in the Arctic (Fig. 3) puts pressure on national capabilities, and all responsible nations want to do their best to ensure an acceptable level of operational safety. As this is logistically complicated in the Arctic and very expensive, no single nation can be expected to undertake the challenges of dealing with complex large-scale emergencies alone. The Icelandic Coast Guard is a law enforcement agency with responsibilities for maritime and aeronautical safety and security, search and rescue (SAR), environmental protection as well as carrying responsibility for Iceland’s defense capabilities and cooperation. The Icelandic Coast Guard is responsible for instigating and coordinating all maritime and aeronautical SAR operations within the Icelandic SRR. The sheer size of this area means that the Icelandic Coast Guard’s tasks are unusually complex. Today’s environmental issues are not nation-centric but require cross-border partnerships, blending the best of local knowledge and skill with complex technologies and specialities. One of the most important aspects of the Icelandic Coast Guard’s role is therefore maintaining situational awareness in its area of responsibility through strong surface visuals, as well as data gathering on natural conditions and human activity. The Icelandic Coast Guard operates three off-shore patrol vessels, one hydrographic vessel and several fast boats. It also has a Dash 8 fixed-wing maritime surveillance aircraft and three Super Puma rescue helicopters for surveillance, search, and rescue. 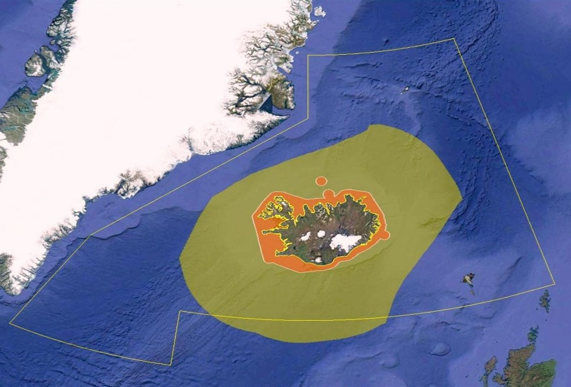 Furthermore, several position reporting systems and satellite imagery complement maritime surveillance and the functions of the Icelandic Coast Guard. Research and polar prediction can help the Icelandic Coast Guard to meet the hazards and threats in its area of operation. The recent signing of the Arctic Council Agreement on Enhancing International Arctic Scientific Cooperation is good news (Arctic Council, 2017). In short: Weather and environmental observations, forecasting and prediction matter to the Icelandic Coast Guard. To give the reader an insight into how crucial good observations and prediction of sea and weather conditions are to our operations we will look into a real life inspired scenario that could play out during a normal working day at the Icelandic Coast Guard. Therefore, now let us return to the evacuation scenario above, where the duty officer of our operations center has been notified about a situation on the east coast of Greenland: a researcher has suffered a skull fracture on board a research vessel. JRCC Bodo has been alerted as well. The patient clearly needs evacuation but the assets in the region are scarce. Now, a critical phase of gathering information and assessing options starts. 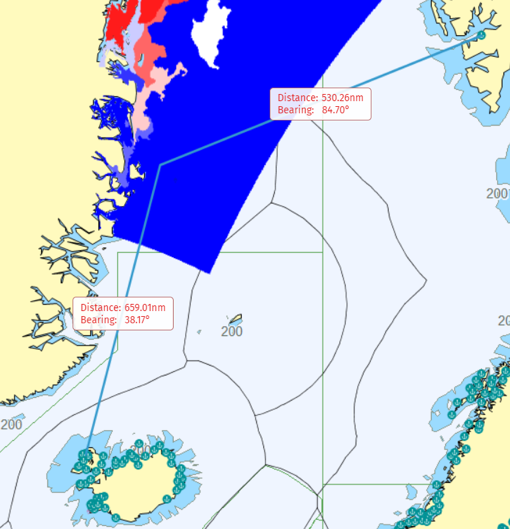 Some information is ready at hand: JRCC Bodo has already informed that they can provide fuel for helicopters in Jan Mayen, and fuel is available in Constable Point, Greenland. Due to the distance from land to the site of emergency, one helicopter would not suffice; the operation would need a second helicopter and crew for safety. This evening, calling on a second crew presents a challenge. Valuable time is spent checking options of a second helicopter crew, and the SAR mission coordinator feels the ruling regime of time and distance. The flight department and the helicopter crew are alerted, and they start working on flight planning, for which they need to visit several web pages and programs. They study pictures of the vessel to look for the best place to perform the hoist operation. They plot the position of the vessel on a chart and measure distances. For such a long flight, correct and credible weather information and forecasts are crucial. The crew gathers different forecasts for the area to take into account any worst-case scenario. The information they look into includes information on wind, barometric pressure, cloud cover, precipitation, sea and air temperatures, and sea state. They even need to know about sea ice in the area. Forecast models give a good overview but any in-situ observation in the area can be of additional help. In-situ observations can come from land, aircraft, our involved research vessel, any vessel along the path, or even from weather buoys transmitting real or near-real time observations. Our colleagues in Norway and Greenland have also been doing similar planning. Eventually, the decision was taken to direct the vessel towards Svalbard, and when within range, hoist the patient with a Norwegian helicopter and evacuate to hospital. The operation could take more than 24 hours – not the optimal situation for the patient, nor too flattering or heroic but this is what we expect when dealing with operations in the Arctic. Rescue assets are scarce in the Arctic, and the research vessel in this scenario could very well become the good Samaritan rendering the first assistance on scene in a much more wicked future scenario. This scenario exemplifies how and why the ICG is motivated to support the development of polar environmental forecasting products on which its operation depends. Our procedures are well practiced and rehearsed, but for better situational awareness during planning and mission, solutions supporting overlay analysis could be beneficial. The European Maritime Safety Agency (EMSA) is currently taking steps in the right direction (see Fig. 4), with a graphical user interface integrating vessel data, earth observation data, and meteorological ocean data. The Icelandic Coast Guard commits to cooperation with data providers and makes an effort to provide valuable feedback in order to improve their services. In this way, the ICG is motivated to support the scientific community, by providing valuable data, while the scientific community provides better models in return. For the purpose of informing a long term strategy and proactive operations, the ICG is not only interested in short-term forecasting, but also in climate change predictions and consequences thereof. So, how is the Icelandic Coast Guard supporting scientific research and prediction? Let us look at some examples. Since early this year, we have been collaborating with the Scripps Institution of Oceanography on a study of ocean dynamics in response to a changing climate. The U.S. Office of Naval Research is sponsoring the project, and partners are the Icelandic Coast Guard, the Icelandic Marine and Freshwater Research Institute, and the University of Iceland. One of the interests motivating the partnership is to better understand the coupled physics involved in ocean circulation change so we might improve predictive weather and climate models. Tangible effects of climate change include reduced ice cover during summer months, thinner and more dynamic sea ice, and change of weather patterns – effects with direct consequences for maritime activity and coast guard operations. The first efforts by the team focus on deploying state-of-the-art instruments to measure waves, currents, atmospheric pressure, and sea surface temperature. The instruments deployed include wave gliders from Liquid Robotics and different kind of drifters from Scripps (Fig. 5). 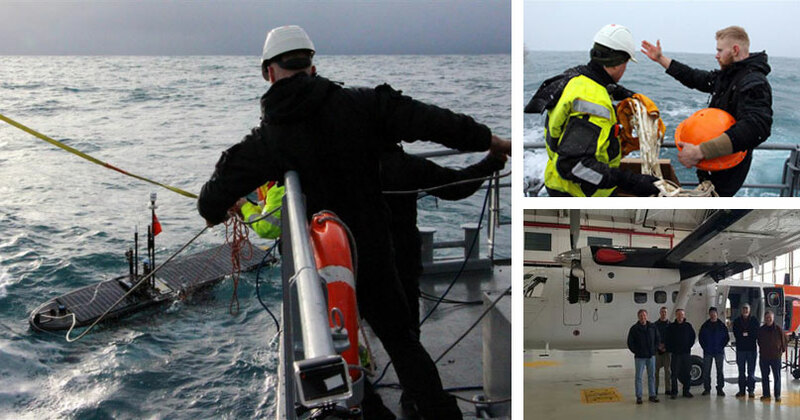 Icelandic Coast Guard vessels deploy and retrieve wave gliders, and our vessels, the vessels from Marine and Fresh Water Research Institute, and voluntary observing ships from EIMSKIP (North-Atlantic transportation company) have deployed the drifters. Occasionally helicopters are used to deploy drifters. Our fixed-wing aircraft has also deployed drift buoys, for example in connection with the Arctic Coast Guard Forum search and rescue exercise Arctic Guardian 2017. The buoy successfully transmitted its position and drift as well as wave data and sea temperature in support of the conducted search operation. In connection with the collaboration, Asgrimur L. Asgrimsson, Chief of Operations for the Icelandic Coast Guard, expressed that: “The Icelandic Coast Guard remains committed to its support for marine science in the North Atlantic, which is among the roles entrusted to the organization by Icelandic law” (Scripps Institution of Oceanography, 2017). Another project supported by the Icelandic Coast Guard is the “Ice Edge” project taking to ice edge scientific research in the Denmark Strait. A U.S. Naval Post Graduate School Twin Otter aircraft with wide-ranging monitoring equipment measured the energy exchange between the sea and the air at the ice edge. The data collected is not widely available and will therefore be of significant help in creating forecasts and in many research projects connected to climate and sea ice (University Centre of the Westfjords, 2017). In-situ observations from autonomous research instruments provide situational awareness for safer at-sea operations and coast guard missions. Data from such instruments improves prediction and Arctic forecasting capabilities and thus help us understand the physics and dynamics of the emerging Arctic environment. Providers and users of polar environmental forecasting products have significant shared interests, and more focus should be put on the dialogue between the two. The Icelandic Coast Guard makes an effort to support scientific research and liaise between communities of different background such as science, industry, response, and academia. The Icelandic government is looking into the possibility of establishing an international SAR research and response cluster in Iceland, where these communities would have a formal structure around their cooperation, which could be a powerful step towards a safer Arctic. Arctic Council Task Force on Telecommunications Infrastructure in the Arctic. (2017). Telecommunications infrastructure in the Arctic: a circumpolar assessment. Arctic Council Secretariat.